Quite recently, Audi had the support of the State of Nevada to continue on the road, its tests for driverless cars. 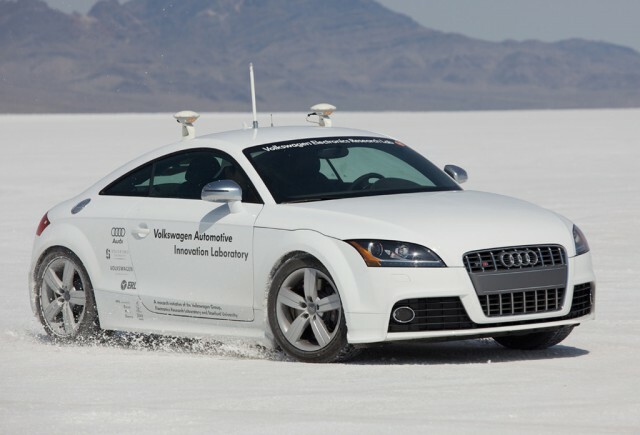 In 2010, Audi TT unmanned had traveled the 20 kilometers of track rally famous Pikes Peak, in just 27 minutes. This week at the Consumer Electronics Show (CES) in Las Vegas, the German brand revealed to the general public technological advances in autonomous cars. The technological approach of engineers Audi aims mainly to take control of the car when driving becomes boring for the driver, especially on highways, in traffic and in the cities generously dotted with traffic lights. In a second time, it aims to ensure that the autonomous car can perform overruns, recognize different motorway exits and parking alone, among others in public parking lots at several levels. At CES, Audi has also mentioned his recent discoveries in all matter of Internet connectivity, with the help of Google Earth and Street View. Will it be a driver in the car?